This year, the kids and I again made our annual pilgrimage to downtown DC to participate in the March for Life, and Nikki held down the fort with the young ones who couldn’t go out in the 15 degree weather. Unlike previous years, though, we first attended the Arlington diocese’s Youth Rally and Mass at George Mason University’s Patriot Center. 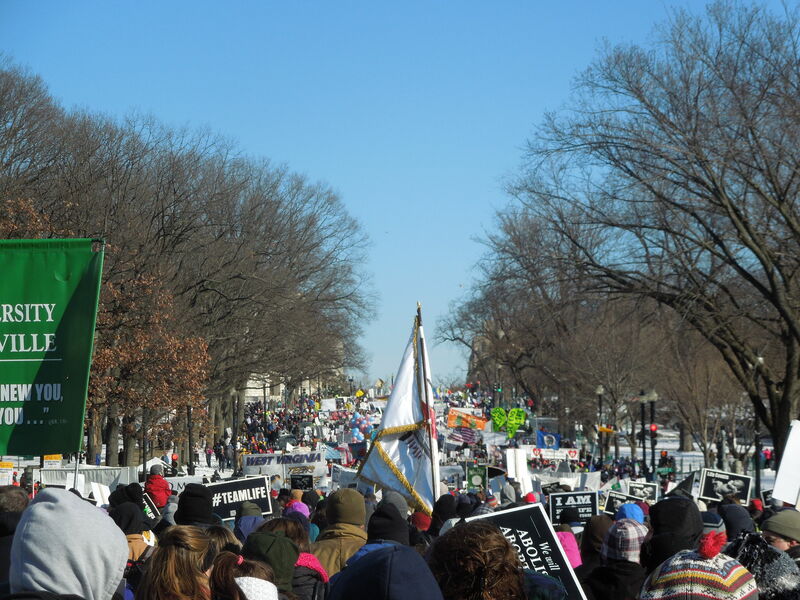 The snow and extreme cold that hit the day before the March kept some away from the Rally and Mass, but there were still several thousand youth and their leaders gathered to celebrate life and pray for the protection of all life in our society—from conception to natural death. 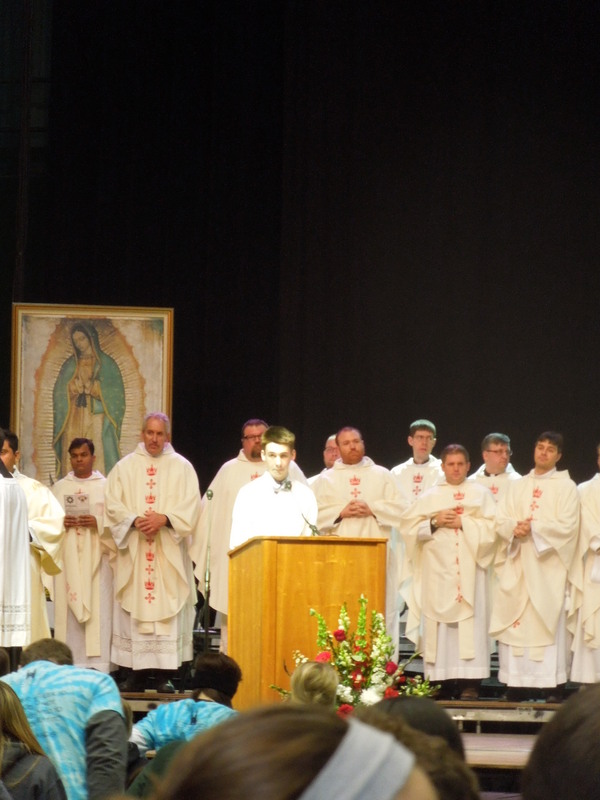 Before the Rally started, dozens of priests heard Confessions, face-to-face. The youth lined up to receive God’s grace in Reconciliation. I was blown away by the conversations among the youth around me while I stood in line, as they talked seriously about sin. It was such an encouragement, and also very humbling. These were kids interested in holiness, which isn’t exactly something our culture encourages. Our son, Charlie, also was asked to lift up the Prayers of the Faithful at the Mass—right after Bishop Loverde’s homily. That also was a pinch-myself moment. It was hard to believe, that less than three years ago, we weren’t even Catholic. I’m so very thankful for where God has brought Nikki, me, and our children in such a short period of time. All of this was only confirmed by the March itself. After the Rally and Mass, we headed downtown and joined the hundreds of thousands marching from the Mall, past the Capitol and the Supreme Court. This year, again, the crowd was overwhelmingly young and upbeat, singing hymns and praying the Rosary. I remain 100% convinced that, by God’s grace, it is ONLY a matter of time before the tide turns and the value of all human life, regardless of stage, is recognized and protected by law. This entry was posted in Abortion, Confession/Reconciliation, Culture of Life, Jason and tagged Arlington diocese, March for Life, Roe v. Wade. Bookmark the permalink. What a wonderful affirmation of this faith journey for your family. May God’s richest blessings be upon you. Thanks Jason for this comment and for standing up for life and anti-abortion. Thanks for teaching my grandchild that the greatest gift a parent can give a child is life. To rob society of, what God blessed us with is sin. We cannot be blessed as a nation until we recognize the sacredness of life. Jason you’ve always been a sincere, searching, humble Christian. I’m so glad you’re no in full communion with God’s Church and that we have you on our–i.e., His–side completely. Keep on keeping on. Thanks so very much, Chris. Blessings to you!